Meet your veggie tray’s new best friend: Carrot Hummus. Simple, flavorful and guaranteed to disappear. Hummus is the ubiquitous condiment of late. It is versatile, flavorful, healthy and oh, so easy to make. Believe me, REALLY easy to make. And it’s nice to have healthy options at parties, but let’s be clear, healthy doesn’t have to be boring. 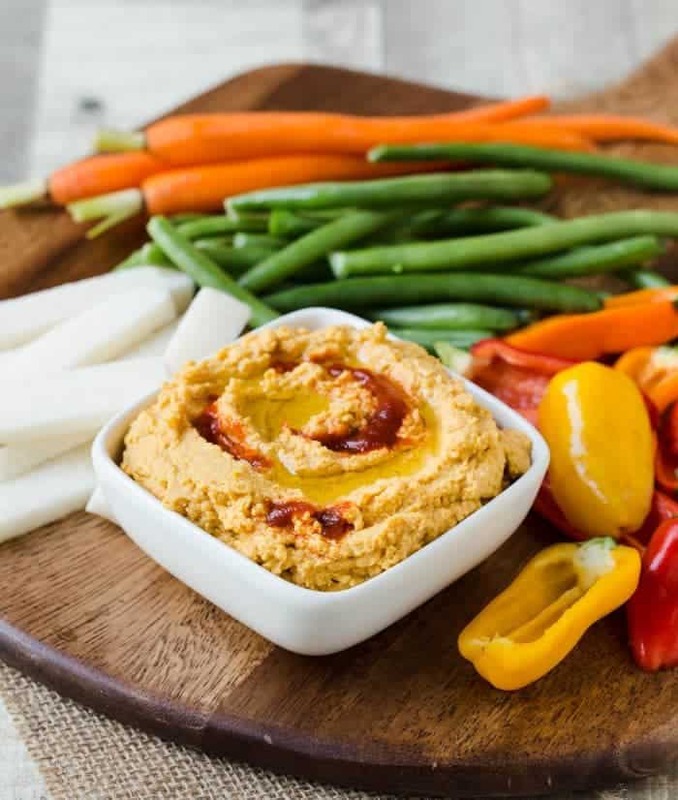 This Carrot Hummus is the perfect way to make your veggie tray the star of the party. So often the veggie tray is the last thing to go at a party, but not when you add some fun hummus flavors to it. 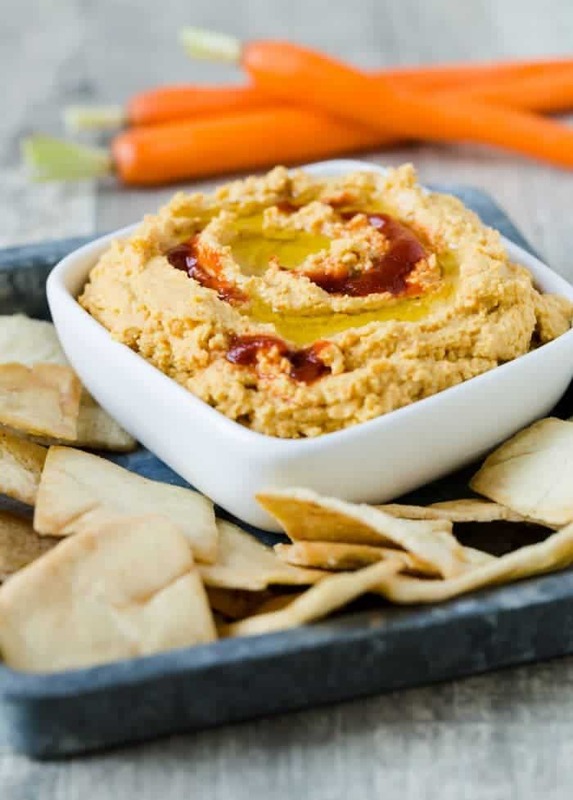 Some of our favorites are Cilantro Jalapeno Hummus, Edamame Hummus and we are adding this Carrot Hummus to the list. The cooked carrots give it a slight sweetness which is balanced out by the zippy garlic and a touch of tahini. 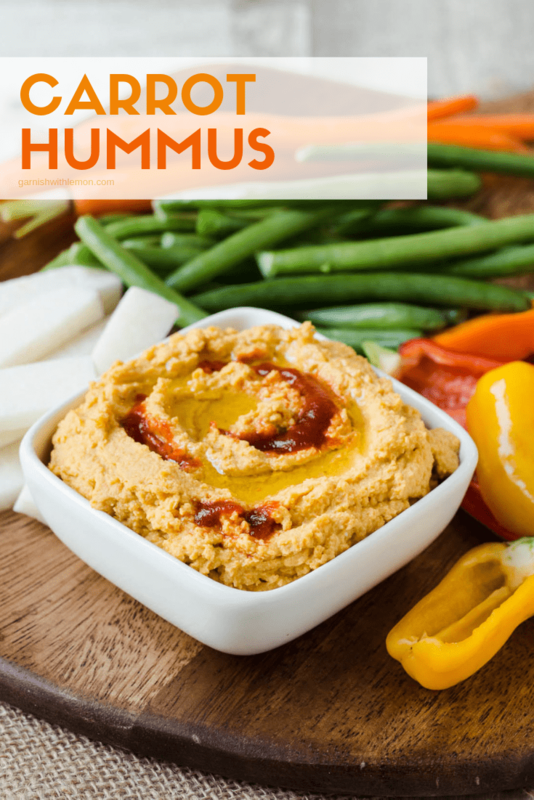 It’s sure to please many palates…even those who aren’t sold on hummus. Not only is this a fabulous addition to a veggie tray, you can also use it as a spread on sandwiches or just eat as a dip with pita chips. However you use it, it’s easy, flavorful and packed with nutrients. Which means I can eat all the bacon wrapped anything without guilt. And that is a win-win all around. Tip: This Carrot Hummus recipe makes a large batch and will keep in the refrigerator for up to two weeks! Place all ingredients in the bowl of a food processor. Mix until smooth. Refrigerate for at least one hour to let flavors develop. If hummus gets too thick after refrigeration, add a drizzle of olive oil to get desired consistency. Glad you enjoyed! Fun to add your own twist! Love hummus of any kind. The addition of carrots makes this one very good. Plus there is no additional oil. I cooked the carrots in a steamer to same vitamins and rinsed the garbanzo beans. Used sea salt for additional flavor. Used real garlic instead of frozen. Please understand that I love your recipe. I am not slamming it in any way. I made the revisions based on my own taste. Try it, you might like it. What did you drizzle over the top, it looks pretty. Hi Jan, it’s a combination of olive oil and sriracha. Yum! Thanks, I made it and the jalapeno hummus for Easter. Everyone favored the jalapeno. I think the sriracha would have been good on the carrot for that little spice hit, next time. I absolutely LOVED this!! Many of my colleagues tried it and are asking for the recipe. I also added some pickle juice (because I am pickle obsessed), some red pepper flakes, and swapped the tahini for 3 parts natural peanut butter, 1 part sesame oil (because I didn’t have any tahini). Thank you for the delicious recipe! Wow! This was incredible! I just made a big batch and I’m super excited to eat it on a warm whole grain pita with some pure maple syrup drizzled on top. Nothing says fall quite like this! I’m so glad you loved it! It is definitely a keeper! Thanks for being a Garnish with Lemon reader!